So many exciting things have happened in the last couple of days! On Friday, I received my package from Patternworks. 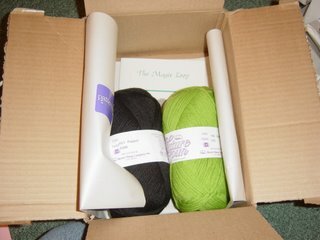 I now have the proper yarn to make the alien scarf! I also got "The Magic Loop" pamphlet, so I can learn how to make objects like socks on just one circular needle! Now, I have to tell you. I was all set for this weekend. 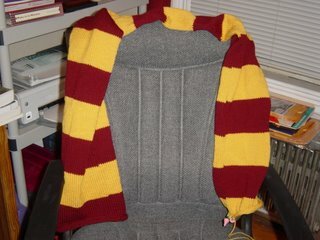 I was going to finish my Harry Potter scarf, start the alien scarf, and watch some bad movies in the process. Well, I did wat ch some bad movies. I had a plan! I had rules! I had books to read! I don't know what happened. I drove to the post office and the library, and instead of going straight home, I got on the highway. I kinda ended up at Fabric Place in Warwick. I didn't know why I was there, but I was just going to look at the yarn. Maybe admire the Noro yarn some more. How was I supposed to know that Fabric Place was having a 25% off everything sale? How was I supposed to say no to 25% off? The rules did not involve sales. The yarn was so pretty. The yarn was on sale. 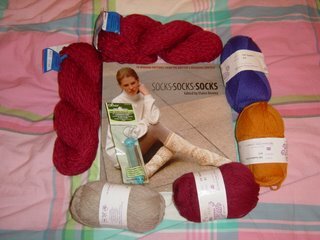 All the yarn was on sale. All the knitting books were on sale. I ended up leaving the store with a bag, one bag, I will just have you know. 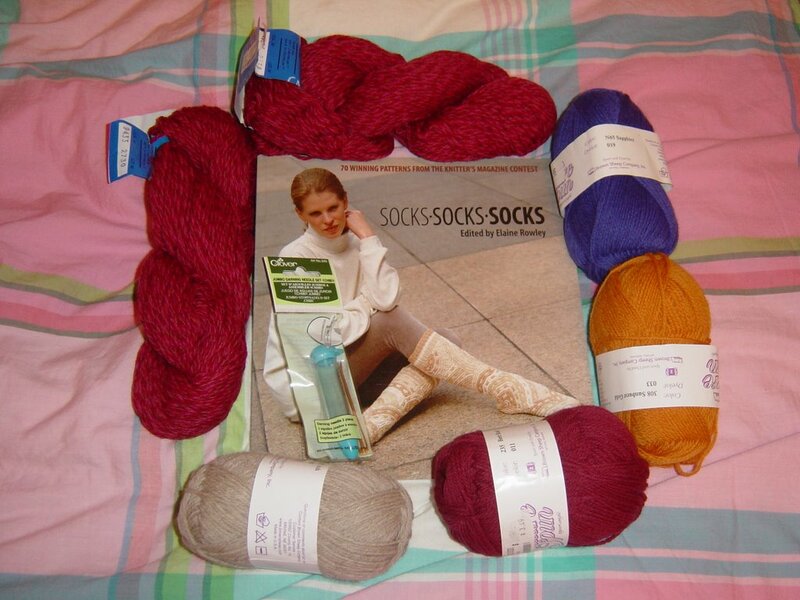 After I left Fabric Place, I went to B&N and got Mason-Dixon Knitting book. It was too beautiful to put down. I am excited about the patterns in the book and the cute writing too. Oh! Another really exciting thing happened, I got added to the ScienceKnits webring! I am part of a Webring! It was so wonderful to see the link work! I will let you know when I get added to the other two webrings.